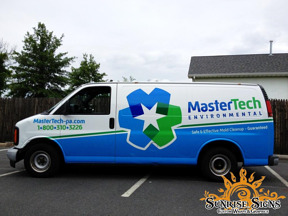 MasterTech Environmental Stands Out with Chevy Express Van Wraps in Philadelphia! Owner of MasterTech Environmental, Len Wendowski takes pride in the services he offers to Philadelphia and Eastern Pennsylvania. This mold inspection and removal contractor wanted to brand his franchise so they contacted Sunrise Signs to print and install this stunning Chevy Express van wrap.